Charles Spencer Chaplin was born in Walworth, London,on April 16, 1889, the son of two music hall performers, Charles and Hannah Chaplin. His parents separated before he was five years old. His mother struggled to make a living despite help from young Charlie who first appeared on stage at the age of five. In 1896, seven-year old Charlie briefly became an inmate of the Newington workhouse, together with his mother, Hannah, and his older half-brother Sydney. They went through the usual admission procedure of being separated from their mother, the children having their hair cut short, and the workhouse uniform replacing their own clothes which were steamed and put into store. In June 1896, after three weeks at Newington, the two children were transferred to the Central London District School at Hanwell. They made the journey in a horse-drawn bakery van and spent time in the "approbation" ward and were then separated with Charlie going to the infants' section and Sydney to the main school. 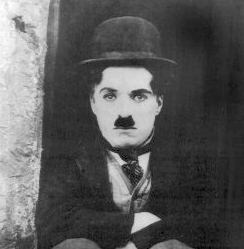 In his autobiography, Chaplin recalls that on Saturday afternoon, the bath-house was reserved for the infants who were bathed by older girls — he suffered the ignominy of receiving an all-over wash with a face-cloth from a fourteen year-old. On reaching the age of seven, he moved to the older boys' department. He recounts the story of a boy of fourteen trying to escape from the school by climbing on to the school roof and defying staff by throwing missiles and horse-chestnuts at them as they climbed after him. For such offences there were regular Friday morning punishment sessions in the gymnasium where all the boys lined up on three sides of a square. For minor offences, a boy was laid face down across a long desk, feet strapped, while his shirt was pulled out over his head. Captain Hindrum, a retired Navy man, then gave him from three to six hefty strokes with a four-foot cane. Recipients would cry appallingly or even faint and afterwards have to be carried away to recover. For more serious offences, birch was used — after three strokes, a boy needed to be taken to the surgery for treatment. Chaplin himself once received three strokes with the cane, apparently for an offence he did not commit. Two months later, the children were returned to the workhouse where they were met at the gate by Hannah, dressed in her own clothes. In desperation to see them, she had discharged herself from the workhouse, along with the children. After a day spent playing in Kennington park and visiting a coffee-shop, they returned to the workhouse and had to go through the whole admissions procedure once more, with the children agaian staying there for a probationary period before returning to Hanwell. Sydney, on reaching the age of eleven, left Hanwell to join the training ship Exmouth. Charlie remained at the school until January 1898. During his remaining time there, he caught ringworm — an infectious disease of the scalp which was common amongst pauper children. Its treatment required the head to be shaved and treated with iodine which made sufferers the subject of ridicule by other boys. After a brief period back with his mother, Chaplin was sent for a while to the Lambeth workhouse and then to Lambeth's children's schools at Norwood. However, when Hannah was admitted to the Cane Hill Asylum, both brothers went to live with their father. In 1906, Charlie became a music-hall clown in Fred Karno's Mumming Birds company. With Karno, he visited the USA in 1913 and his act was seen by film producer Mack Sennett who hired Chaplin for his film studio, Keystone. Charlie's tramp character, which no doubt drew on the experiences of his early life, eventually made him the highest paid actor in Hollywood.